From Curious33(BarbraNews.com Visitor)Just a quick review of the concert, as it is late here. Barbra gave 3 encores that included "The Summer Knows" again. She was enthusiastically greeted by the audience and received countless standing ovations. What was NEW was an instrumental version of Barbra's wedding music from "The 4 Horsemen of the Apocalypse", to which she hummed several bars of the melody!! I hope somebody has taped this segment This was a gift to Barbra on the occasion of Barbra's and Jim's wedding anniversary by the conductor. Later in the show, Jim appeared on stage with a huge cake which he presented to his wife. It was a touching moment. 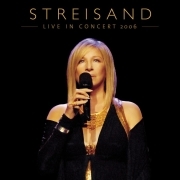 Barbra now introduces "Down with Love" by saying "Here's a little jazz for you". The weather was a miracle, as it had been raining most of of the day of the concert.